Organic duck breasts. Succulent dark meat with rich, buttery skin, from ducks left to range free for the fullest flavour. Grilled, pan-fried or slivered into a stir fry or broth, this versatile treat can be either a quick weeknight dinner or a fine-dining masterpiece. Approximately 2 duck breasts per pack. 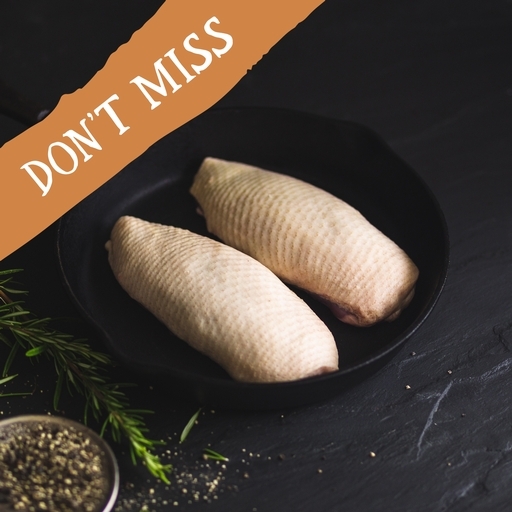 Don't miss our duck breasts. They will be available for deliveries between the 15th and 20th April while stocks last. Preheat your oven to 180°C/Gas 4. Lightly score the fat, making sure not to cut through to the flesh. Season generously. Place fat-side down in a cold frying pan and bring gently up to a medium heat. Fry for 6-8 mins until the fat is golden, spooning away excess fat as it gathers in the pan. Turn over and fry the flesh side for 2-3 mins before transferring to the oven for about 8 mins. Remove and allow to rest for at least 5 mins before serving. Cook for longer if you want them well done. Deliveries between 5th and 10th November will be previously frozen and not suitable for home freezing.